It is important to keep your baby's skin protected, mums! With increasingly new technology, we often forget that the old ways of doing things have evolved a lot and that the old techniques were more natural. This also applies to raise babies. Natural methods are the best way to care for your child since they do not use chemicals and depend on what comes naturally. Using fewer chemicals at home and in your baby is a great way to start with the natural care of the baby. Bath time with a natural baby wash can be an excellent way to relax and spend time with your baby. Be careful when choosing natural products for babies. Although a product can be advertised as natural, you should read the fine print carefully. Make sure all the ingredients are really natural and that there are no chemical additives. Products like baby shampoo are not essential to keep your baby clean. You can simply use soap and water when bathing to wash your baby's hair. 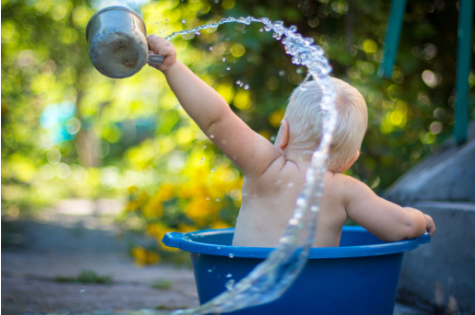 While some parents choose to give their baby a bath in a sink or bucket, the use of a proper baby bath will make bathing easier and more fun. At the end of the bath, give your baby a massage to help him fall asleep more easily and comfortably. Learn some massage techniques for babies and discover their benefits. You will only gently press your baby, but the baby and parents will appreciate the results. You and your baby will have more sleep hours. Use natural baby oils that do not damage the sensitive skin of your newborn. The natural care of the baby also involves wearing only natural fiber clothing. Cotton is your best choice because it is the most comfortable and breathable material for babies. Stay away from synthetic materials, which can often be uncomfortable for your baby's skin and can cause allergies in some cases. The use of natural fibers should also be a rule when it comes to bedding. In general, baby bedding is made of natural fibers, but you should always be careful and check the label before buying anything. And be sure to use natural soap to wash your baby's bedding and clothes. A baby carrier is another way to care for your baby naturally. These devices allow you to keep your baby close to your body and leave your hands free to do other things. Above all, you need to buy cribs to ensure a healthy sleep for your baby. Nowadays, you can find so many different types of beds that will give you a difficult selection time during your purchase. To get the best option, you need to see the comfort of your child and provide a safe environment for your child. Today, you can find baby products recommended by experts in most of the retail stores, where you can find a better exposure to products that meet the needs of the little ones. Get the best way to verify the right one for your little one. When you visit your grocery stores, you can find so many natural dyes and fewer preservatives without harmful chemicals. Choose skin products that are organic and contain natural fragrances, detergents, and colorants. Above all, you should get the best detergents to wash your baby's clothes. Always use mild, environmentally friendly powders that do not damage the baby's skin.